The best test is the one carried out by the sailor himself! Only you can feel the difference sailing with a low drag propeller, the joy having strong maneuverability in both forward and reverse and the safe feeling, knowing that the folded propeller won´t catch fishing nets and old lines. If you haven´t had the chance to try yourself, ask sailing friends who already have a Flexofold propeller. Or read our customers own statements on Customer References. We have also collected a few tests form independent magazines who have tested Flexofold against other propeller brands and types. Just follow the links to read their results. "On test, it gave the equal highest forward thrust of all props, and highest top speed. It also had one of the lowest side-thrusts. Going astern, its performance was the best of all the folding propellers. At a cruising speed of 6 knots, the engine was turning at 2,300rpm, compared to the 2,500rpm of our standard fixed prop and most of the other props on test". Yachting Monthly, May 2009. 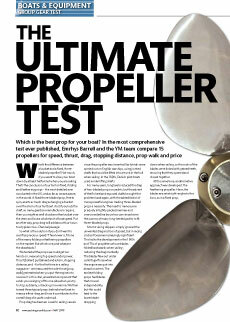 Click on the link below to download (pdf) The Ultimate Propeller Test. "In the new assessment, Flexofold gets a Seglen-Tip for the best bollard pull in both forward and reverse, however, the AutoProp lose this recommendation, since its values are only average". Seglen 6/2009, correction to test in 10/2008. 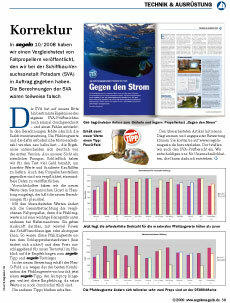 Click on the link below to download (pdf) - available in German only! If you have problems opening the files, please click here to download a free copy of Adobe Reader.